EA Ai Grid LAOS VR PO is an expert advisor using customized indicators to identify trend reversals. The entries are usually accurate and in case if the trend reverse with a delay the positions will be managed by a smart grid system. This system uses a grid of orders which increases lot size after the stop loss is reached. The grid size is limited for more safety. It includes a security filter which prevent the possibility of getting into an unexpected trend without rollback caused by a new release. Micro broker with low spread is recommended to get better results. 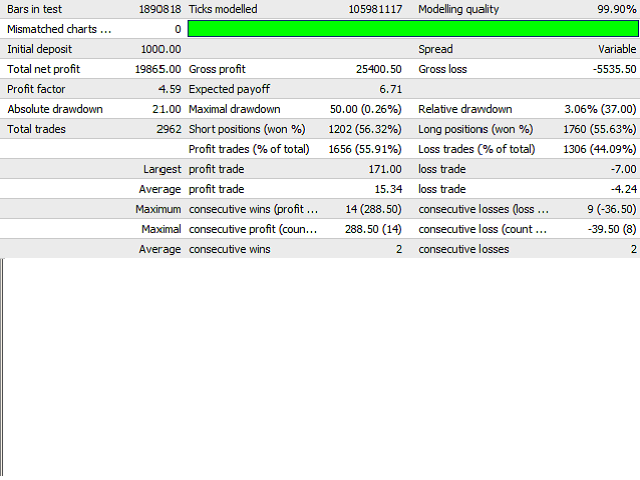 ECN broker with low spread is recommended to get better results. 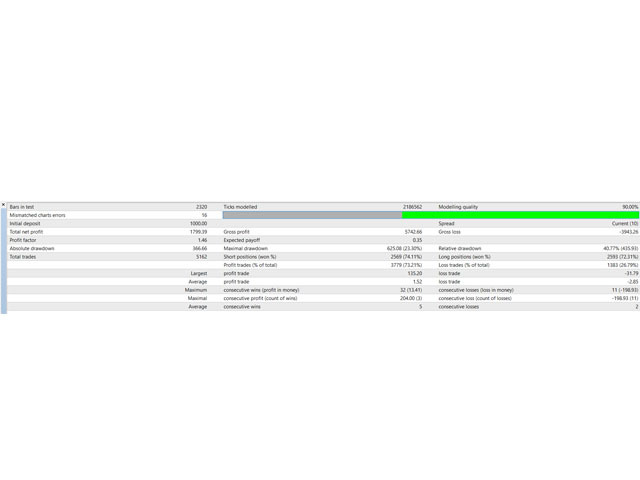 Enable auto settings for fixed lot - set to true to automatically set the lot size based on investment amount and risk level. Investment - Amount to invest in account currency. Risk Level - Risk level of your investment. It will adjust lot size / stop loss / take profit / grid stop loss. Money Management (MM) Method - method to calculate lot sizing and stop loss. Fixed Lot Size - initial lot (used when MM is "Fixed Lot"). Lot based on % balance - initial lot calculated based on % of the balance (used when MM is "Percentage Balance"). Fixed Stop Loss - stop loss in account currency (used when MM is "Fixed Lot"). Stop Loss based on % balance - stop loss calculated based on % of the balance (used when MM is "Percentage Balance"). Max Lot - maximum lot for the EA operation. If value is 0 then no limit. Lot Factor - lot factor for the second and subsequent orders. Grid Stop Loss - size of stop loss. Max Grid Size - number of orders max to open at the same time. Trail Distance - trailing stop distance (only for non automatic trailing stop). Max Spread - maximum spread allowed before a pending order triggers. Magic Number - magic number to distinguish orders from others EA. Comments - comments on trade operations. Optimized to work with .GBPUSD.EURGBP. 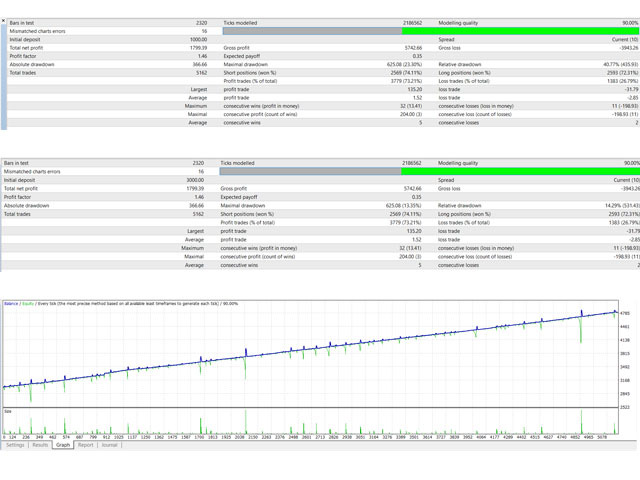 Broker IC Markets Optimized to work with .GBPUSD.EURGBP. Minimum recommended deposit is 100$.1 couple. 200$.2 couple. for initial lot set to 0.01. Minimum recommended deposit is 1800$ .1 couple. 3600$ .2 couple. 5400$ .3 couple. 7200$ .4 couple. 10000$ . 5 couple. for initial lot set to 0.01. Minimum recommended deposit is 1000$ .1 couple. 1800$ .2 couple. 3000$ .3 couple. 5000$ .4 couple. 10000$ . 6 couple. for initial lot set to 0.01.